Nature's Best provides an extensive range of premium foods that are specially formulated for your chicks, pullets and hens throughout the seasons. Peckish Produce is high in protein, calcium, vitamins and minerals, with all feeds featuring a carefully selected range of nutrients. Whether your looking to encourage rapid growth and feather development in chicks, or looking to keep your hens healthy and producing beautiful eggs, there is something to suit the unique needs of your birds. Selected from: Oats, Maize, Wheat, Barley, Triticale, Lupins, Canola meal, Soya meal, Vegetable oil, Limestone, Di-calcium Phosphate, Salt, Vitamin and Mineral premix. Contains medication to stop coccidiosis. For chicks 1 day - 10 weeks of age. Peckish Chick Starter is suitable for chicks from one day old to 8-10 weeks of age. 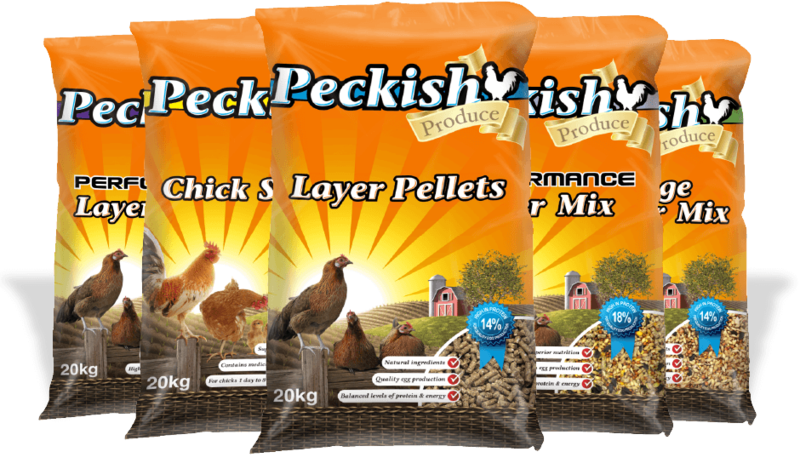 From this point a smooth transition to Peckish Poultry Grower is recommended until point of lay - at which stage Peckish Layer Pellets (14%) are ideal, or for a more substantial, higher protein feed, we recommend Peckish Performance Layer Mix. This feed contains 125gm/tonne Amprolium Hydrochloride and 8gm/tonne Ethopabate for the prevention of coccidiosis. WARNING: Do not feed to any birds which are producing eggs for human consumption. Healthy addition to scratch feed. Peckish 100% Wheat is perfect for adding to your chickens' regular scratch feed to provide them with more energy. 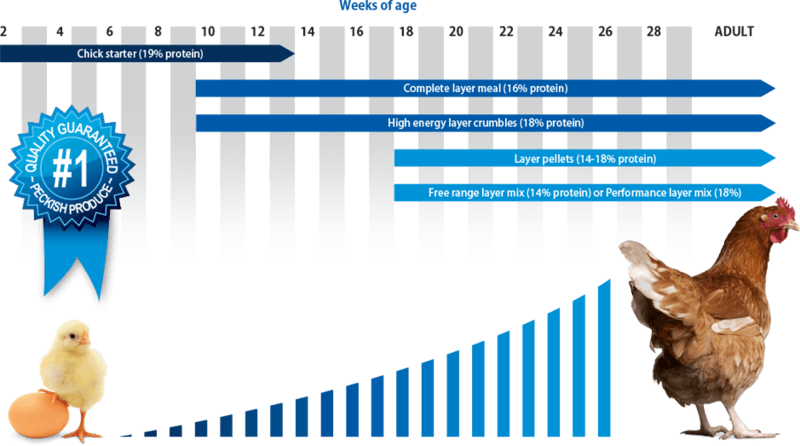 For a more substantial, higher protein feed, we recommend Peckish Performance Layer Mix. Selected from: Wheat, Barley, Canola Meal, Limestone, Oats, Legumes, Vitamin & Mineral Premix. Easy to use pellet form. High in protein (15%) for quality egg production. Peckish Free Range Layer Pellets have been specifically formulated for all breeds of laying hens from around 18 weeks old. Peckish Free Range Layer Pellets are a complete ration, featuring balanced levels of protein and energy to maintain a healthy bird and ensure quality egg production. For a better performance, higher protein feed, we recommend Peckish Performance Layer Pellets. Selected from: Wheat, Barley, Triticale, Oats, Lupins, Sorghum, Maize, Sunflower seed, Shell grit, Salt and vegetable oil. High in protein (14%) for quality egg production. Peckish Free Range Layer Mix has been specially formulated for all breeds of laying hens from 18-20 weeks old. Peckish Free Range Layer Mix is a complete ration, featuring balanced protein and energy levels to maintain steady, healthy growth. For a better performance, higher protein feed, we recommend Peckish Performance Layer Mix. Selected from: Oats, Maize, Wheat, Barley, Triticale, Oats, Lupins, Canola meal, Soya meal, Lucerne meal, Vegetable oil, Limestone, Di-calcium Phosphate, Salt, Vitamin and mineral mix. High protein (18%) to promote growth. High levels of protein and energy in a handy pellet form. Peckish Performance Layer Pellets are specially formulated with high levels of protein and energy for top performance in egg production and fertility rates. Peckish Performance Layer Pellets are a premium performance ration featuring added calcium, phosphorus and trace elements for optimum eggshell quality and maintaining hen's health. Selected from: Wheat, Barley, Sorghum, Maize, Lupins, Black Sunflower, Vegetable oil, Canola oil, Soya meal, Lime, Vitamin and mineral premix. High levels of protein and energy in a regular scratch mix. Peckish Performance Layer Mix has been specially formulated for all breeds of laying hens from 18-20 weeks old. Peckish Performance Layer Mix is a complete ration, featuring high levels of protein and energy to encourage steady, healthy growth. Selected from: Wheat, Lupins, Canola meal, Soya meal, Lime, Di-calcium Phosphate, Salt, Vitamin and mineral premix, Vegetable oil. Very high levels of protein (24%) for optimum growth. Peckish Game Bird Starter has been specially formulated for a very large range of game birds in mind. Game Bird Starter features high protein and energy for maximum growth and health. Selected from: Wheat, Barley, Triticale, Lupins, Canola meal, Soya meal, Lucerne meal, Vegetable oil, Limestone, Di-calcium Phosphate, Salt, Vitamin and mineral premix. High protein (16%) to promote growth. Ideal for optimum chick growth. Peckish Grower Crumbles are a high protein and energy ration containing essential vitamins and minerals to promote optimum growth and health as the bird develops. This product is the ideal feed for the growth stage between chicks and laying hens. We recommend moving to Peckish Performance Layer Mix at around 20 weeks of age. Selected from: Wheat, Barley, Triticale, Lupins, Canola meal, Lucerne meal, Vegetable oil, Limestone, Di-calcium Phosphate, Salt, Vitamin and mineral premix. Peckish Complete Layer Meal is a specially formulated layer ration featuring high levels of energy and protein for maximum egg production. Complete Layer Meal is a complete ration featuring added calcium, phosphorus and trace elements for premium eggshell quality and for maintaining hen's health. For a more substantial, high protein feed, we recommend Peckish Performance Layer Mix. Selected from: Oats, Maize, Wheat, Barley, Triticale, Lupins, Canola meal, Lucerne meal, Vegetable oil, Limestone, Di-calcium Phosphate, Salt, Vitamin and mineral premix, Bentonite. High in protein (18%) for quality egg production. Peckish Duck Pellets are specially formulated with high levels of protein and energy for top performance in egg production and fertility rates, for laying and breeding ducks in a non-commercial settings. Essential part of a healthy diet. High calcium for quality egg shells. Shell Grit is an important part of a chicken's diet. Shell Grit contains significant levels of calcium that are essential to a laying bird's diet in order to ensure top quality egg production. Shell Grit also helps aid the bird's digestive system to break down food in the gizzard. Pet's Harvest Poultry Range offers the essentials for all breeds of chickens and laying hens. The range includes a complete ration feed for laying hens in either a pellet or mix form, and wheat for supplementing other feeds such as vegetable scraps.